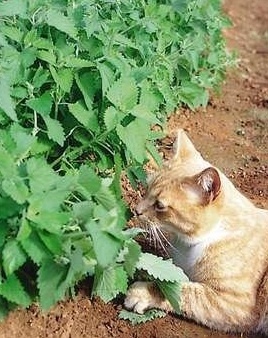 You may be familiar with catnip as an herb that cats can’t seem to stay away from. It is also an herb in the mint family that can often be found commonly growing throughout the United States as a naturalized alien plant. 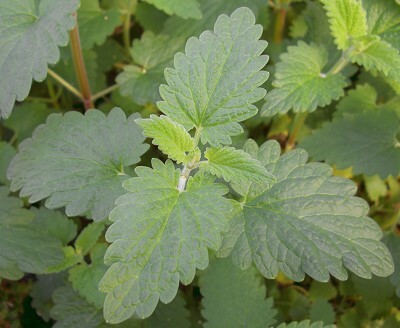 Catnip, or Nepeta cataria by its scientific name, is delicious to nibble on. It is known medicinally for its relaxing properties. It is one of the first plants we learned about at a Black Belt Winter Retreat for this purpose; as the catnip tea was brewing and the kitchen filled with the smell of the herb, all who breathed it in could feel its relaxing qualities. It can be taken as a tea to remedy insomnia, especially that which is induced by anxiety. Master Pearson has cautioned me not to take it regularly for more than a few days as it can cause dependence. “My first medicinal introduction to catnip came during a sweat-lodge ceremony. I was quite dirty, from a hot, dusty hike, to a point where the dirt was caked on my skin. I was also having trouble with an infected hair follicle on my shoulder, due to the rubbing of a strap from a heavy bundle. Grandfather said that a sweat lodge would help clean my pores and get the duct of the hair follicle working again so it could drain. After drinking plenty of water, Grandfather gave me a big mug of very strong catnip tea. He explained that the tea would promote profuse sweating very much like the yarrow, and sweat I did. It felt as if my body had become a waterfall, and I could feel my pores blown wide open. As I exited the sweat lodge, I felt cleaner than I ever had before. The next day, any traces of the abscess and pus buildup were gone. I did, however, find it necessary to drink almost two gallons of water in the next twenty-four hours. To make a good tea, use the fresh herb made from the new green leaves for a strong tea, the dried herb from the new green leaves for a regular tea [you can often buy dried herbs in bulk at a natural food store- Ms. Doll]. Use one small palmful of broken leaves to about one cup of boiling water. Let the tea steep for ten to twenty minutes depending on the strength of the tea needed. Dosage is one to three cups a day, not to exceed four days. Tea is also good for pain, cramps, and intestinal problems, and has a soothing quality that has a calming effect on most people. The best leaves to collect are from plants growing in a partially suny area, preferably with a southeast exposure. Collect leaves before the flowerheads develop. For milder teas, collect the leaves as the flowerhead is developing, or until the seeds are produced. I find that one of the most potent stages of the plant is when it is collected either in early spring or the second blooming of late fall. As an herbalist, I collect the plant beginning in the spring, and ending in fall when it turns brown. I place the collection in separate containers and label them accordingly so they can fit the needs of the people that come to me. Note that catnip can also be taken as a smoked herb, rolled in rolling papers and smoked like a cigarette, for its relaxing qualities; however its ability to be habit forming should be remembered, so as with any internal use of this herb, it should be reserved for occasional usage only. Tagged with:Catnip, John Heinerman, Nepeta cataria, Tom Brown Jr. Previous PostSummer Blockbuster…ok not quite, but still good.